Holiday Virtual Book Fair – And The Winners Are! On December 1st I was a participant in the Holiday Virtual Book Fair hosted by Black Lilac Kitty. The book fair ran through Saturday, December 7th. It is always wonderful to be involved in the book fairs hosted by Black Lilac Kitty. I have felt in great company with some wonderful authors and found some amazing new reads. 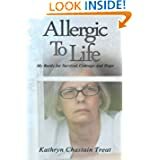 During my participation in the book fair I ran a Rafflecopter Giveaway of 2 e-book copies of Allergic to Life. When the drawing was over, Rafflecopter generated my two winners. Feeling in the giving spirit, I had it generate a third winner. All winners were notified by email as to which format they wanted their e-book. I have heard back from two of my winners and have their permission to share their names with you. When I hear from the third winner, I will update this post. I am excited to be able to share my story with both of you the three of you. Rara just found my congratulations e-mail in her SPAM folder. I am glad she found it.